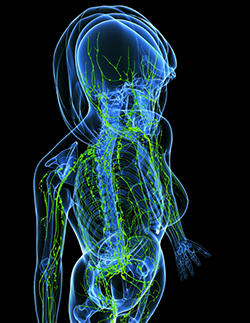 Lymph is formed from the fluid that bathes all the cells in our body tissues. The blood stream carries oxygen and nutrients to all the tissues of the body through arteries. The arteries divide and divide again many times until the smallest vessels, known as capillaries, permeate between all the cells of our bodies. No cell in our bodies is more than a short distance away from its nearest capillary. The fluid in the capillaries leaks out, carrying oxygen and nutrients to bathe the cells and supply their needs. Most of this fluid is reabsorbed back into the capillaries, and enters the veins, which then return the blood stream to the heart. However not all of the fluid is reabsorbed. An estimated 4 litres per day remains surrounding the cells of the body. If left to its own devices this interstitial fluid would build up and cause swelling, and so it is returned to the heart through a separate system of vessels known as the lymphatic vessels. Like capillaries, these are generally thin walled, and like veins they contain one-way valves that ensure that the direction of flow is always towards the heart. The lymphatic vessels join and gather together much as the veins do, and ultimately drain into the large veins in the neck, where the fluid they contain is returned to the blood stream just before it enters the heart. Lymph nodes are small nodules of cells found along the length of the lymphatic channels, and through which the lymph flows. The cells they contain are lymphocytes (a form of white blood cell) that are part of the immune system of the body and macrophages that are also important in mounting a defence against infection. Lymphoedema (also known as Lymphedema and lymphatic edema) is swelling caused by a build up of lymph fluid in the tissues. It can affect any area of the body, but most commonly develops in the arms or legs. It is caused by an impaired lymphatic system which has been damaged by surgery or infection, or failed to develop properly. When the lymphatic system is not working normally, fluid builds up in the tissues, and because it cannot drain away it causes swelling and discomfort. Primary - usually caused by a failure of the lymphatic system to develop properly causing lymphodema at any time of life (particularly at adolescence). Secondary – caused by damage to the lymphatic system by trauma, injury, infection, surgery (where lymph nodes have been removed) and radiotherapy. Reduced mobility, paralysis, and poor circulation can also play a part in the development of lymphodema. Skin care- regular washing and the application of emollients to hydrate the skin and keep it in good condition. Special exercises to help maximise lymph drainage. A useful description of exercises for lymphoedema can be found on the Cancer Research UK web site. 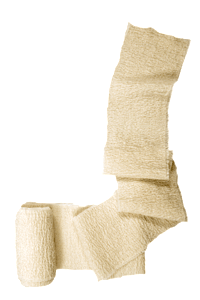 Compression garments or bandages to reduce limb swelling and ease discomfort. Manual Lymphatic Drainage (MLD) a specialised massage technique carried out by a trained therapist who moves the skin in a specific direction to aid lymph drainage and help open up new drainage channels to help reduce limb volume. Simple lymph drainage massage techniques (SLD) based on MLD that patients are encouraged to do themselves on a regular basis. Combined decongestive therapy incorporates MLD with bandaging to reduce limb volume. This is an intensive programme of many treatments close together consisting of MLD, bandaging and exercise. Thereafter, regular maintenance MLD treatments are helpful in keeping limb volume under control.